Salil Luesutthiviboon is passionate about noise reduction. Having completed an Aerospace master’s in 2017, his research aims to contribute to a sustainable and quiet future by reducing noise at airports and also at wind turbines. The focus of Luesutthiviboon’s thesis was on designing an optimal acoustic array, which is basically an array of microphones. This array can be used to acquire sound signals from test objects or even from real airplanes. The acquired signal can then be post-processed to generate a sound source map which visualises the sound source location and strength. “Basically, it helps you to ‘see’ the sound,” he says. 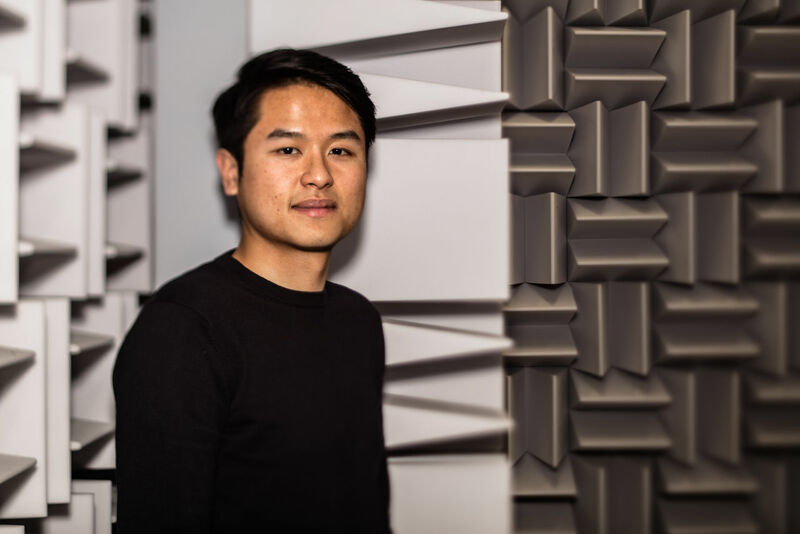 “The knowledge we get from this can help us in designing quieter aircraft in the future.” As part of his research, Luesutthiviboon developed a technique to optimally arrange the microphones on an array. The optimised array has been proven to outperform one of the benchmark designs and it is now installed in one of TU Delft’s wind tunnels for aeroacoustics studies. Currently a PhD candidate, Luesutthiviboon is still researching noise. This time he’s focussing on developing a quiet ‘airfoil’ by using advanced materials to reduce noise emission due to air flowing past it. An airfoil is basically a body, such as an airplane wing or propeller blade, that is designed to provide a desired reaction force when in motion relative to the surrounding air. So in using advanced materials for airfoil noise reduction, Luesutthiviboon is looking at how a quiet airfoil can be used in the design of future wind turbine blades. Working on research that combines academia with industry is important to Luesutthiviboon. “I didn’t want to just do something academic, I wanted more than a thought experiment,” he says. Working on real world problems that plague the aerospace industry has given him that. For example, anyone who has heard a plane take off or land knows that airplanes are loud. The noise they generate is regulated in most countries and restricts how many planes can land, where airports can be built and at what times flights can depart. Reducing the noise pollution would ultimately make air travel easier. Luesutthiviboon’s research does more than ease congestion at Schiphol. As we know, wind turbines provide sustainable energy. And engineers have successfully developed large wind turbines which can harvest a lot of energy. “Unfortunately, they are noisy and that restricts us from exploiting the full efficiency of them,” says Luesutthiviboon. “For example, we have to run wind turbines at lower speeds and install fewer wind turbines to make sure that the noise emission complies with the restrictions.” Therefore, by reducing their noise emission we can benefit from clean energies, like wind energy, even more. To students I would recommend to search for courses or research topics that motivate you, not necessarily in your own department. The best research topic doesn’t have to be most advanced one, but the one that you have ideas and motivation for. Look around for research topics on the webpages of different departments, approach the prospective supervisors to discuss the ideas and possibilities during your first year. Talk to the alumni. They are one of the most suitable groups of people to discuss both about academic life and plans after graduation. I personally joined the Mentor-Alumni programme (MAP) arranged by my faculty, and I had a lot of useful discussions with my mentor when I was doing my thesis.